Today I decided to move it to the second stage. I scooped out most of the apple chunks. 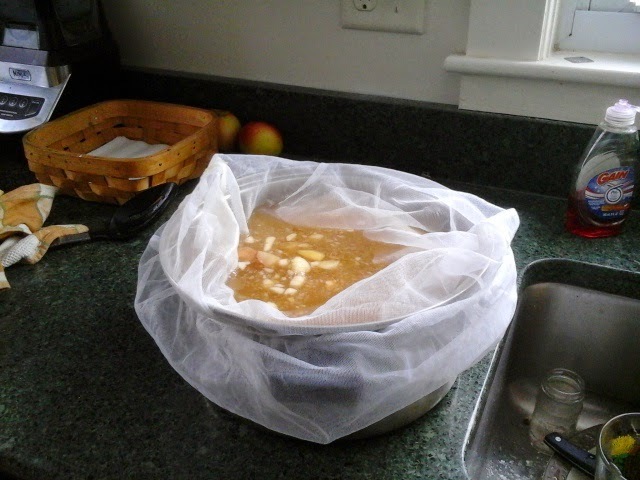 Then, it was matter of straining out the rest so the cider is relatively clear and free of gunk. (Thats a technical cider making term). I used a big nylon mesh bag for this. I think Steve got this for his beer brewing. I just poured the cider mash into a big bowl lined with the bag. I hung the bag up from a cabinet knob, to let it drain while I did a few other things. Two half gallons and a glass. 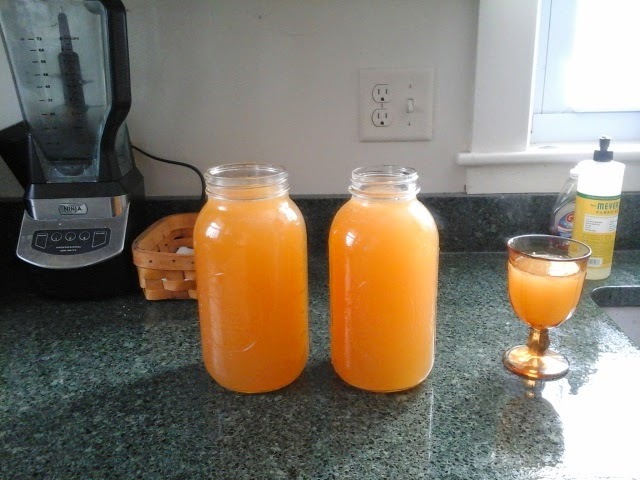 There was about two half gallon jars full, plus a little tjat i just poured in a glass. I tasted it. Surprisingly, it is quite good, a lightly carbonated, slightly fermented apple cider. The alconol content is low, but thats okay. It can continue to ferment a bit. Now, the next step is to let the vinegar making bacteria take over. These acetobacter bacteria will take the alcohol from the yeast fermentation, and change the liquid into vinegar. If you have ever left a bottle of wine open for too long, and then tasted it, you might remember noticing the acid taste. Its the acetobacter at work. Permit me to digress just a bit. Bacteria, yeasts, molds, etc. Are all around us. Our society seems to have this germophobia, and we think we need to constantly disinfect everything. ( Dont get me started on the use of antibacterial soaps and disinfectants. ) Anyway, many of these organisms are helpful. We would not have bread, wine, beer, any alcohol, cheese, sour cream, etc. Without them. And while i am not saying to stop cleaning your kitchen, I am saying that we can embrace a balance ..... like everything else in nature, balance is key. Rather than trying to control everything in nature, we would do better to try to work WITH the natural order. We would all be better off if more of this kind of harmony was present. This way of thinking is how I want to organize our homestead.. If you bake bread alot, your kitchen will develop its own colony of bread making yeasts. You wont see them, but they are there. Ever hear somebody complain that bread made in the breadmaker, or even by hand, in their own kitchen, just didnt taste as good as mom's, even though it was the exact same recipe? Thats because mom's kitchen had its own unique combination of these local yeasts that would get into the bread dough and impart that special something that made mom's bread so good. I could have allowed the cider to sit open, and the local yeasts here would have found their way into the jar and fermented it. I didnt have to add yeast. I did, simply because it speeds things up. But, it would have happened in its own eventually. Where the yeast work in a tightly closed environment, (anaerobic) these acetobactor need oxygen. 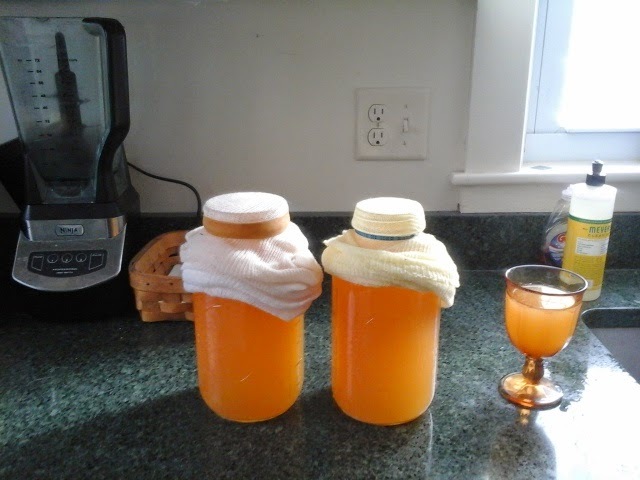 So rather than putting a lid on the jars, i will cover them with cheesecloth to let air in. In doing this, i am allowing the local bacteria to do their work, while the cheesecloth will filter out dust, or bugs, etc. There they are. 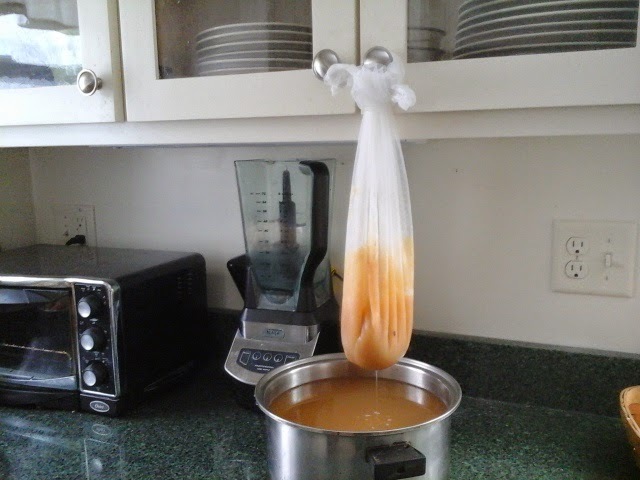 I secured the cheesecloth with a rubber band. 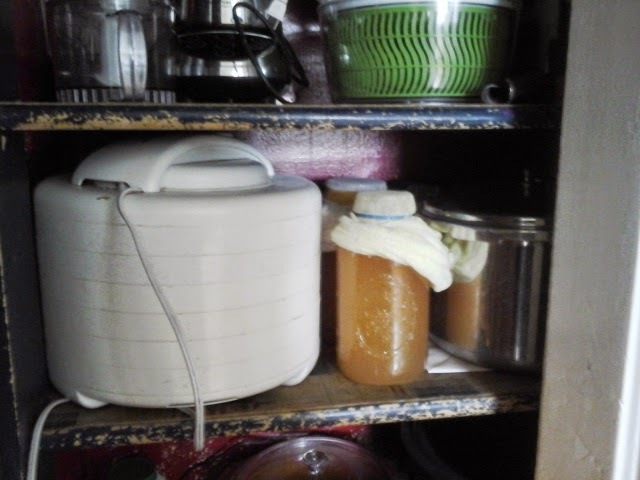 And then, since these vinegar bacteria do not like sunlight, Istick the jars on the cellar shelves where its dark. Now we wait. Eventually, a thin film will form on the surface of the liquid, eventually forming a sort of gelatinous glob. Thats tje vinegar "mother"-the colony of acetobactor that are doing their magic. Cant wait. Nature is amazing. Weather:warmer today, 17 this morning, up to 42.. mostly sunny. wildlife:I saw the solitary duck again today.